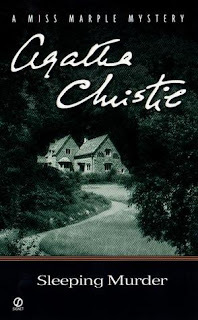 This is my fourth Agatha Christie novel, and my second Miss Marple mystery. I'm quite sure that after a few more novels by Agatha Christie, I'll be used to her twists (well, I hope so.. maybe she has so many things under her sleeves I won't get used to them, haha). Mystery! Gwenda Reed and her husband's newly bought Victorian house reminds her of a dead woman, a man mentioning a line from a play she just saw. The house also gives her a feeling of déjà vu. While she feels that she's been there, the house doesn't feel and look the same as well. She later finds that she live in the house for a few years with her father and stepmother. Solving the Case. A mystery that's been locked away for eighteen years is quite impossible to reach. Yet Gwenda and Giles were able to slowly open the mystery of Helen, Gwenda's stepmother. Slowly but surely, they trace Helen's past - the men she met, she loved, and her life with Gwenda's father. I like both Gwenda and Giles. For me, Giles is the objective solver. He does not completely put his trust on the words of the people they talk to. Gwenda, on the other hand, relies on her feelings. She decides one is not a murder when she feels they are not one to murder. Miss Marple, as Gwenda and Giles guide, successfully lead them to finding the right clues. As I read through, I keep on guessing who's the culprit. I usually side with Giles' idea because of how reasonable he is. Giles' reconstruction of the events that happened based on the clues they have is really interesting. I try to connect the given clues and somehow, they don't really add up to me that is until the revelation. The smooth sailing, intriguing mystery was disrupted around 80% of the novel. The urgency to have the mystery solve escalated. It wasn't just a matter of knowing what happened to Helen and who the culprit is but it suddenly became a must to capture him right at the very moment. While things are still very intriguing, it also became more thrilling. It glued me to the book. Revelation. Ms. Christie had me guessing and guessing and failing (as usual). While at some point the culprit did crossed my mind, I immediately dismissed it because of the clues that... well... I think made him innocent. I find it really good how Ms. Christie put me off there. The ending was really satisfying. At first, I kind of cannot believe it. I mean sure some things add up but they still did not make sense to me until Miss Marple explained everything that things actually made sense to me. OVERALL, Sleeping Murder is a well thought of mystery. While I do think that the revelation was a bit of expected, I still did not see it coming (or it totally slipped off my radar). Ms. Christie has really done it well for me once again. With an intriguing mystery and a thrilling pace, Sleeping Murder is a highly recommended read for those who enjoy mystery.